Beanbag Alphabet Fun: Beanbags are a wonderful tool to encourage physical activity, body awareness, motor planning and coordination skills in children. They are inexpensive or you can even make them yourself with socks and some rice. So grab a beanbag for each child and try moving through the alphabet with your beanbag. You can download this as a one page handout below. A: Put the beanbag on your ARM. B: Put the beanbag on your BACK. C: CATCH the beanbag in the air. D: Put the beanbag DOWN on the floor. E: Put the beanbag on your EAR. F: Put the beanbag on your FOOT. G: GALLOP with your beanbag. H: Put the beanbag on your HEAD. I: Walk IN a circle around your beanbag. J: JUMP with your beanbag. L: LEAP over your beanbag. M: MARCH in a circle with your beanbag. N: Put the beanbag on your NOSE. O: Jump OVER your beanbag. P: Put the beanbag on your PALM. Q: QUICKLY toss your beanbag up. R: RUN in place with your beanbag. S: Put the beanbag on your SHOULDER. T: TWIRL in a circle with your beanbag. U: Put the beanbag UNDER your foot. V: Hold the beanbag VERY high up. W: WALK backwards with your beanbag. X: Slide your beanbag up your leg and pretend to take an X-RAY. Y: YELL the word beanbag. Z: ZOOM around the room with your beanbag. Looking for more beanbag activities? Check out 50 Sensory Motor Activities for Kids! 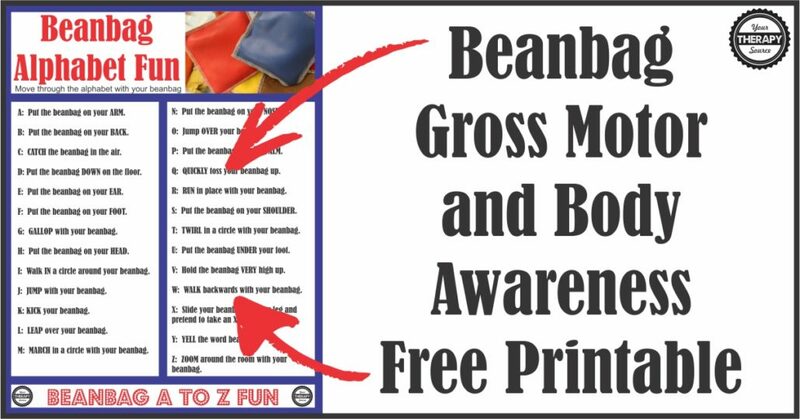 This ebook includes an whole section on games to play with beanbags. Need more alphabet movement and learning activities? Check out Sensory Motor Group Activities A to Z and The ABC’s of Movement®- Combine Movement with Literacy.